Non-voting Associate Membership is available to all former District Attorneys and former assistant district attorneys, deputy attorneys general, state prosecutors, federal prosecutors, counsel for the PA State Police, police chiefs and such other persons as are approved by the membership. 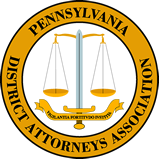 The Pennsylvania District Attorneys Association (PDAA) is the only legal association for prosecutors in Pennsylvania. For the annual fee of $75.00, an associate membership in the PDAA entitles you to the benefits described below. Invitations to all conferences and trainings offered by the PDAA and PDAI. Discounts on registration fees for PDAA and PDAI events. The PDAA Handbook – a valuable directory of Pennsylvania’s 67 District Attorney’s offices and the PDAA headquarters. A one year subscription to our quarterly newsletter. Ongoing updates on caselaw and legislation. Access to the PDAA network of resources and contact with your peers and colleagues. To apply for associate membership in the PDAA, complete the application form linked below and mail or fax it to the PDAA headquarters. Once your application is approved, we will invoice you for the $75.00 associate member dues.